The entire country of Italy is a dream for food and wine lovers. Dining in cities like Rome or Milan offer endless options for traditional Italian meals, chic contemporary cuisine, bustling food markets, international eats and beyond. But the best Italian cuisine goes so much further than just pizza or pasta in a busy city. Here are some charming destinations you should visit to sample all different kinds of famed Italian delicacies. Fans of the crisp, fizzy drink should weave through the winding hills of the Strada de Prosecco — Prosecco Road. 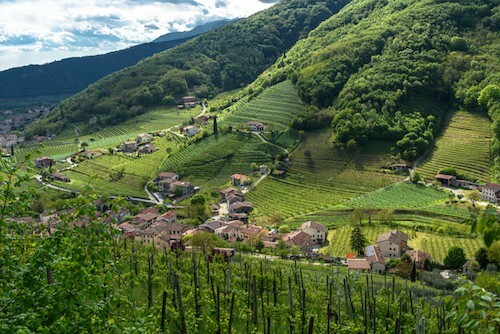 These lush, green vineyards north of Venice are sandwiched between the towns of Valdobbiadene and Conegliano. Plan to tour local wineries, sample all sorts of Prosecco (there are over 30 in the region) and explore small, hidden villages scattered among the hills. It’s worth getting a driver or arranging a tour so you can fully enjoy the area (and its bubbly). RELATED: Sparkling Wine vs. Champagne — What’s The Difference? 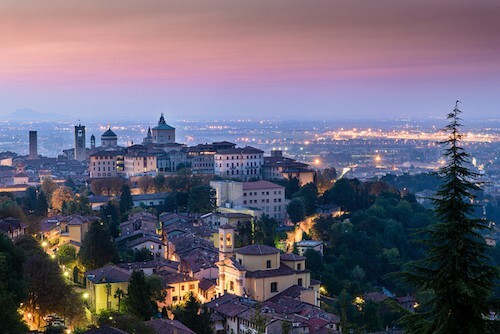 Just a short jaunt from the fashionable Milan, Bergamo’s prized citta alta, the historic city center, is a Medieval town perched a top a hill. Views from afar are simply stunning, as the stucco rooftops and bell towers peek through clouds of mist. But the best way to enjoy the city is to take the funicular up and then start your own foodie tour. Start with trying some bagòss, a stinky Lombardian cheese that should be nibbled at room temperature. Then, savor polenta, a famous cornmeal dish. Top it off with torta di Donizetti for dessert, a light, fluffy desert cake named after a famous composer, washing it all done with local Valcalepio red wine. Didn’t you know? Sicilians eat ice cream (well, sorbet) for breakfast! This special form of ice cream is called granita. It’s typically made with either almonds or lemons, both grown locally in Sicily. Caffe Sicilia in Noto is famous for its granita, having served local patrons for over 120 years. If you haven’t yet booked your plane ticket, once you consider the Nero D’Avola wines and the many agriturismos (B&Bs that are typically located on farms, growing their own fresh food and serving it to guests) dotting the Noto region, you’ll likely want to do so. Genoa is known for its world-renowned Pesto, a sauce made from basil, pine nuts, garlic, salt and cheese. The city is so proud of its special sauce that they even lifted their liquids 100 ml ban at the airport, but only for pesto!. Plan to make a donation to Flying Angels, a charity that flies children with illnesses around the world if you want to bring your jar of pesto along in your hand luggage. Although the Umbria region is revered for its extra virgin olive oils and Orvieto white wine varieties, the real claim to fame is the mushrooms. You can take special tours and trips to hunt and pick all sorts of mushrooms, especially truffle or Porcino mushrooms. If traipsing around in the hills to find your lunch isn’t your thing — don’t worry. Instead, enjoy a variety of mushroom dishes happily relaxed at a local restaurant, glass of Orvieto in hand. 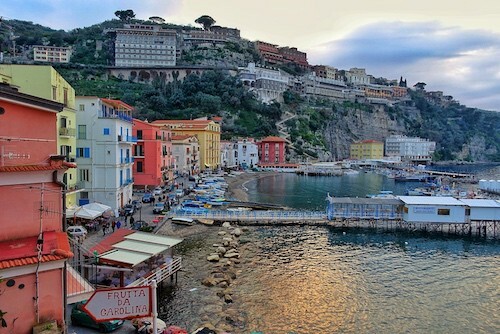 Lemon-lovers should head to Sorrento, the gateway to Italy’s Amalfi coast. Famous for everything lemon, you can eat lemon gelato, cake, juices and plenty of other delights inspired by the citrus fruit. The most notable, of course, is the world-famous limoncello, a spirit made from alcohol and lemon peels, served ice-cold after a meal. Anything lemon is best enjoyed on a terrace overlooking the sea. You may have heard of Parma’s most popular cheese: parmigiano. After all, it’s named after the city itself! Besides the granular, crumbly cheese, there’s also Proscuitto di Parma, thinly-sliced ham that practically melts in your mouth, several other cured meats and cheeses like salame or capicola and torta fritta — a fried bread that pairs perfectly with the aforementioned charcuterie. Savoryour cheeses and meats (and some fresh pasta) alongside wines from the Emilia-Romagna area, like an Albana white or a strong Barbera red. Because Tuscany encompasses so many special spots for foodies, it’s so hard to pick just one. The entire region is paradise for food lovers, thanks to the expansive Chianti wine zone, Florence’s amazing foodie scene and a number of tiny villages retaining age-old recipes and cooking traditions. You can’t go wrong diving into a mouthwatering Florentine steak, pairing it with a full-bodied Chianti. For more specific towns to check out in this article on small towns in central Italy worth a visit. The birthplace of pizza, Naples has some of the most delicious thin-crust varieties, perfectly crisped in wood burning ovens at 800° Fahrenheit. The traditional margarita comes smothered in mozzarella di bufala cheese and juicy tomato sauce. When you get tired of pizza, try the Ragu, a flavorful red sauce made with tender beef. It’s not just the savory stuff in Naples — the city is also known for its pastries, like the sfogliatella, a layered breakfast treat smothered in powdered sugar, or a baba, a small cake soaked in rum.